Mbola mitohy ny fintaintainana momba ny tsy fahafantarana izay manjò ilay Syriana mpanao sariitatra Akram Raslan, nandrombaka ny fandresena tamin'ny lokan'ny fahasahiana 2013 teo amin'ny fahasahiana, nosamborin'ny fitondrana Assad tamin'ny Oktobra 2012. Raha misy ny tatitra milaza fa novonoin'ny fitondrana Assad izy taorian'ny kisarintsarim-pitsarana, ny hafa kosa nanambara fa mbola velona izy. Nosamborin'ny miaramilan'ny fitsikilovana Syriana ilay mpanao sariitatra, raha tao amin'ny gazetin'ny fitondrana Al-Fedaa tao Hama izy tamin'ny 2 Oktobra 2012. Akram, izay nandresy tamin'ny lokan'ny fahasahiana 2013 avy amin'ny Cartoonists Rights Network International (CRNI), dia nisy nitati-baovao fa notsaraina mangingina tsy misy vavolombelona, tsy misy mpisolovava, tsy misy fangatahana fitsarana ambony ary tsy misy fanantenana hahazo ny rariny. We've learned that on July 26, 2013 Akram Raslan and other prisoners of conscience including journalists, artists, singers and other intellectuals were secretly put on trial with no witnesses, no defense attorneys, no appeal, and no hope for justice. From unconfirmed and sketchy reports we also learned that they were all condemned to life imprisonment. Nahare izahay fa tamin'ny 26 jolay 2013 dia notsaraina mangingina tsy natrehim-bavolombelona, mpiaro, tsy misy fangatahana fitsarana ambony, ary tsy misy fanantenana hahazo ny rariny i Akram sy ireo gadra noho ny fanehoan-kevitra hafa, izay ahitana mpanao gazety, artista, mpihira ary manampahaizana hafa . Avy amin'ny tatitra tsy voamarina sady ambangovangony no nandrenesanay ihany koa fa voaheloka higadra mandra-pahafatiny avokoa izy rehetra. 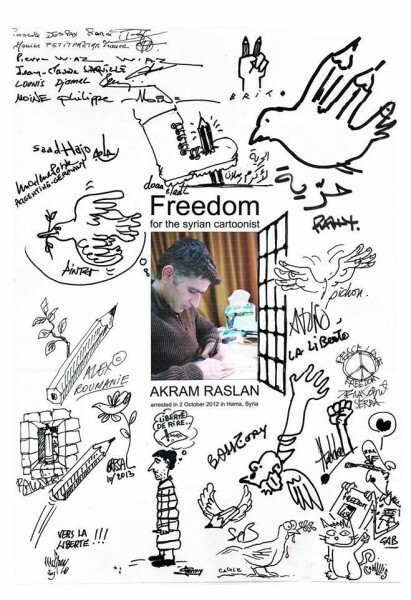 I am saddened to write that Cartoonists Rights Network reports that Syrian cartoonist Akram Raslan has been executed by the Syrian regime after a show trial. Malahelo aho manoratra fa nitatitra ny Tambajotran'ny Zon'ny mpanao Sariitatra hoe novonoin'ny fitondrana Syriana ilay mpanao sariitatra Akram Raslan taorian'ny kisaritsarim-pitsarana iray. Tyrants might be able to fight off criticism or an insurrection or even assassination attempt with truncheons, bullets and terror. But where do they turn their guns to stop their people from laughing at them? Can there be any more efficient, more powerful, and cost-effective way of empowering a people than dispelling their fears with a courageous cartoon on its way to letting them laugh through their fear? Mety ho afa-manosika ny tsikera, na ny fiokoana eny fa na ny fikasana hamono amin'ny alalan'ny kobay na bala na fampihorohoroana ny olondozabe. Fa mitodika mankaiza kosa ny basin-dry zareo hanakanana ny olona tsy haneso azy ireo? Misy ve ny fomba mahomby kokoa, mahery kokoa, ary tsy mandany vola hanomezana hery ny olona hanala ny tahotra ankoatra ny sariitatra sahisahy mampihomehy amin'ny alalan'ny tahotra? Aza alatsaka mihitsy ny peninao, ireny no tena atahoran'i Assad indrindra. Mandria am-piadanana Akram Raslan, mpahay tantara an-tsary novonoin'ny fitondrana Assad. Akram Raslan, dead or alive, we remember and cherish you. Akram Raslan, na maty ianao na velona, mahatsiaro anao sy mankafy anao izahay. I am sorry I couldn't reach down into the pit and drag you out Akram. Please forgive me. Perhaps your sacrifice will motivate us to look again into the mirror, and ask again where we straddle the line between fear and courage and challenge us, again, to take a new first step. Miala tsiny aho tsy nahatratra ny lavaka ary nanala anao tao ry Akram. Miangavy anao mamelà ahy. Angamba ny sorona nataonao no hanetsika anay hijery amin'ny fitaratra indray, ary hanontany hoe aiza izahay no miampita ny tsipiky ny tahotra mankany amin'ny fahasahiana ary mihaika anay, indray, handray dingana vaovao.